Two women among 10 recipients of the award including George Mitchell, the US Peace Envoy to Northern Ireland. An Irish Loreto Sister and a medical doctor, who has dedicated her life to hospice care in Africa, were among those recognised by President Michael D Higgins yesterday. 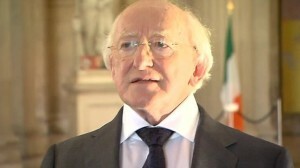 “As Uachtarán na hÉireann, I have often witnessed the great commitment of Irish people abroad to those who are vulnerable and in need – reaching out to them through peacekeeping, humanitarian and development initiatives,” President Higgins said as he awarded the Presidential Distinguished Service Award For the Irish Abroad. He went on to describe Sr Cyril Mooney as someone who for decades has been empowering vulnerable and marginalised people through the provision of education in India. 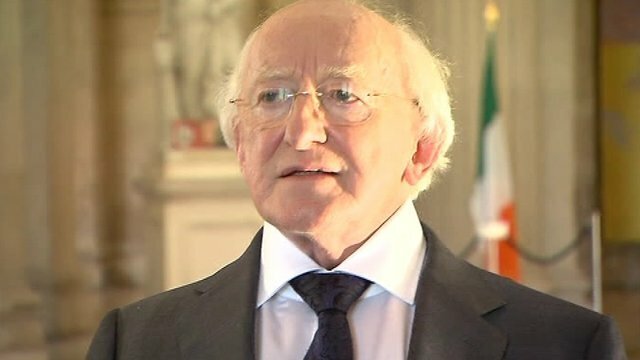 The President said Dr Anne Merriman had ministered to the very ill in several countries in Asia and Africa and had transformed the provision of palliative care. “Their care, compassion and sheer resilience are values that should inspire us all as we go about the business of our daily lives,” he commented. They said such a ‘prestigious recognition’ of her work would again highlight how important it is not to forget those who have no voice and no opportunities and whose dignity and rights need to be protected, upheld and encouraged. The two women were among 10 recipients of the award which included business, community, culture, sports, and education leaders such as George Mitchell, the American Peace Envoy to Northern Ireland and Dan Rooney, a former American Ambassador to Ireland. Sr Cyril, who is a native of Bray in Co Wicklow, made her profession in 1956, and has worked in India serving the poor, destitute and socially excluded children of Kolkata for over 50 years. As principal at Loreto Day School Sealdah, she introduced equality-based education to what was once an exclusively private school for girls. At present, almost half of the 1,500 girls in attendance come from poor families from slums, who are unable to pay school fees while the other half pay their full fees to attend. The Rainbow Programme at Sr Cyril’s school houses, feeds, and educates nearly 250 formerly street-dwelling children, in addition to welcoming another 100 for special classes during the school day. This model has successfully been implemented at dozens of other schools across India, including all of the Loreto Schools in Kolkata. The Barefoot Teachers Training Programme is for young men and women from the slums and villages near Kolkata who lack the basic requirements to attend teacher training colleges. Sr Cyril and her staff have trained over 7,000 teachers through this programme, and the recipients in turn have brought primary education to over 350,000 village children who otherwise would have no access to education. Sr Cyril has now retired as principal in the school in Sealdah but her work continues through the staff, students, and volunteers there. Dr Anne Merriman always wanted to be a missionary, having received missionary magazines from Africa in her Liverpool home. When she was 18, she arrived in Ireland to join the Medical Missionaries of Mary and began her medical degree at UCD. Once qualified she went to work at a hospital in Anua, in south-eastern Nigeria. There she found that terminally ill patients were simply sent home. This sparked what became her lifetime interest in palliative care. In the 1980s after she had left the order, she taught in Malaysia and then in Singapore, and played a key role in introducing palliative care there. On her return to Africa, to Nairobi and the AIDS epidemic, she helped pave the way for the roll-out of hospice care across the continent and founded the Hospice Africa Ireland charity. Millions of patients and families in Africa suffering from cancer and/or AIDS have been helped.